Cover a recycled cardboard circle with a crepe paper streamer to make the base for this cheerful, homemade St. Patrick’s Day wreath. Place a large pie plate on top of box cardboard and trace around it. Measure and center the smaller plate in the middle of this circle and trace around it as well. Alternatively, if you know how to scribe a circle using a pencil, string and thumb tack then you can draw both circles in that way. 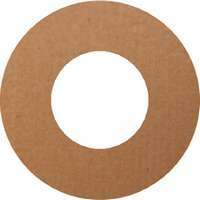 Once you have drawn a suitable donut shape, cut out the large circle then cut out the hole in the middle. You should end up with a cardboard wreath base similar to the one shown here. Cover the cardboard wreath with a padding layer made from strips of newspaper, plastic bags or thin fabric. Cut strips about two or three inches wide from your choice of material, then wind them evenly around the cardboard circle, temporarily fastening any ends into place with small pieces of adhesive tape. You only need a thin layer or just enough to soften the inner and outer edges of the circles. Covering the slightly padded wreath with crepe paper streamer, then glitter rope. Beginning and ending at the top of the wreath, begin winding a layer of dark green crepe paper streamer all around the wreath. You can pull the crepe paper slightly as you work to ensure a snug, secure fit. Secure the end with adhesive tape. 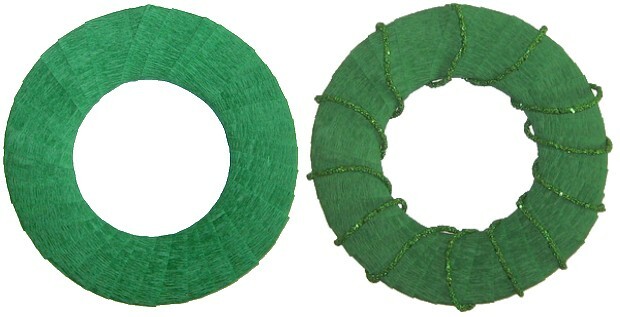 Beginning and ending at the top and back of the wreath, wind green glitter rope around the wreath as shown. Twist the ends of the glitter rope together at the back of the wreath, then rearrange the loops if needed so they lie evenly all around. The floral lei that I used was conveniently just the right size to frame and encircle the wreath. I pushed some of the fabric flowers underneath the loops of glitter rope to keep it in place. If your silk floral lei is larger, you will have to cut it and secure one end at the top of the wreath, then work your way all around, pushing flowers under the glitter rope loops until you get back up to the top. Cut off any extra length and secure the remaining end in place at the back of the wreath with adhesive tape. Place two leprechaun figures on the wreath; one on the left side and the other on the right. 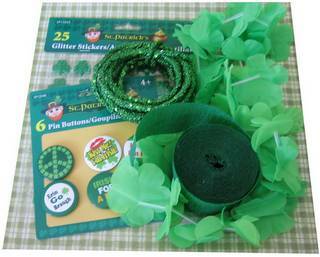 Different St. Patrick’s Day decorations can also be used: for instance, cute leprechaun top hats or bowler hats; a teddy bear wearing a St. Patrick’s Day pin; a rainbow or pot of gold, etc. 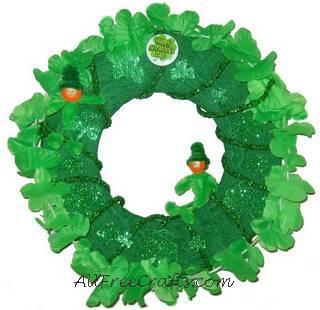 With your main decorations secured, add a “Happy St. Patrick’s Day” pin to the top of the wreath. 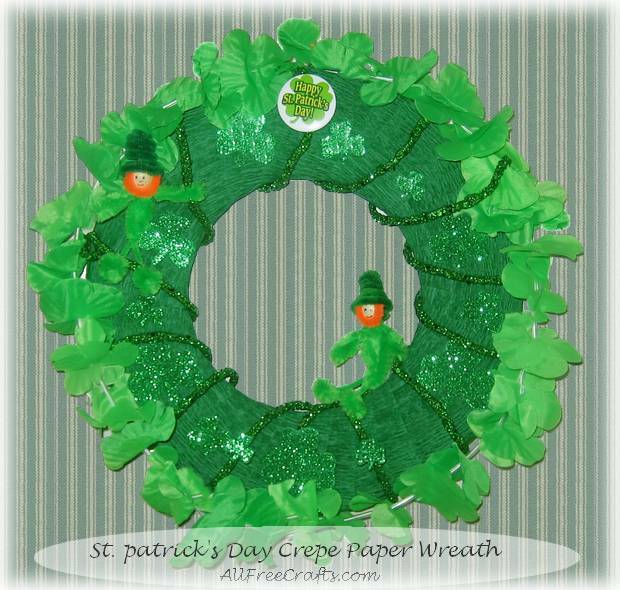 Finally, add as many glitter shamrocks to the crepe paper base as space allows, fastening larger ones towards the bottom and medium or small shamrocks on the upper half for a well-balanced, well-rounded, homemade St. Patrick’s Day wreath.